Found 15 file extension associations related to PlanMaker and 2 file formats developed specifically for use with PlanMaker. 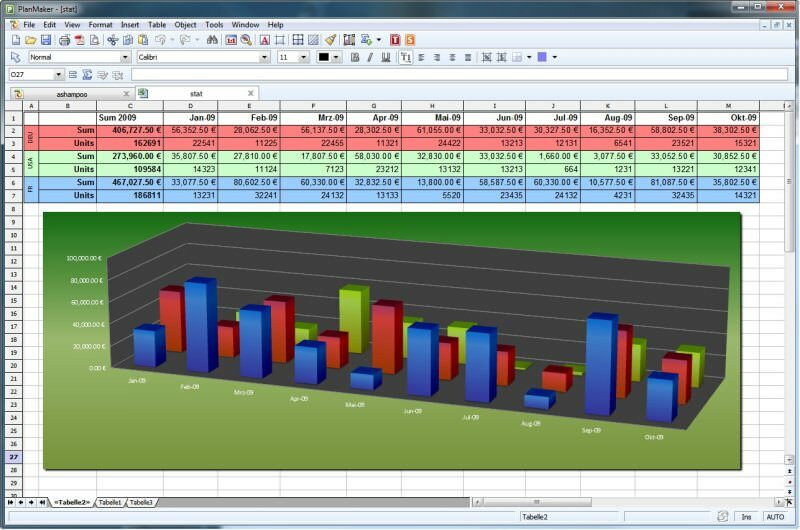 The spreadsheet PlanMaker is on par with Microsoft Excel and offers more than 330 calculation functions that cover areas such as finance, statistics, cost analysis and many more. Form objects, filter functions, automatic summation, grouping of large spreadsheets, syntax highlighting and the new “detective” (formula checker) help to ease the handling of complex charts. Visualize and present your results trouble-free with the powerful chart module that turns your numbers into colorful yet precise charts. Choose from 70 different chart types (2D and 3D) and create column charts, bar charts, pie charts, area charts, bubble charts, pyramid charts etc. With a number of effects like reflections, smooth shadows, elegant color gradients, transparency, and many more you can give your charts a fresh and personal touch. PlanMaker is the default spreadsheet for SoftMaker Office and is also licensed to other suites such as Ashampoo Office. If you need more information please contact the developers of PlanMaker (SoftMaker Software GmbH), or check out their product website.